Viruses… hackers… malware… identity theft… security breaches… it’s enough to make any CEO’s head spin. In order to remain competitive and profitable these days, it’s absolutely imperative that you—and your organization—take control of your IT issues before they take control of you! In his new book The Secure CEO, Vital Systems Security Review expert Mike Foster combines his considerable Internet technology experience with his innate understanding of the latest business and security technologies. 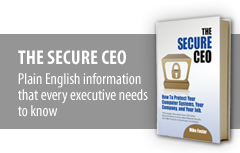 The result is The Secure CEO, the definitive IT handbook for CEOs and key executives. And best of all, it’s written in easy-to-follow “plain english” that readers can understand, regardless of their technological background. Are you sure your network isn’t running illegal programs that have been remotely installed by criminals in other countries without your knowledge? Is your IT team so under-trained or over-whelmed that daily “fires” keep them from performing critical security tasks? Are unclear communication and negative personality types adversely affecting your IT department? The Secure CEO gives you the bottom line answers you need to effectively analyze your current use of Internet technology. Readers will uncover strategies to minimize IT security breaches, tactics for keeping their companies safer, and proven “best practices” to implement to help keep systems secure in the future. IT security has never been a more important business concern. Get The Secure CEO and share its timely information with your entire IT team, key managers, and other top executives. Cut through the confusion and intimidation and harness the power of technology for your company’s advantage. 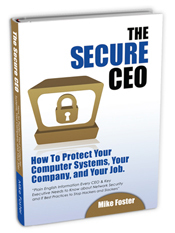 The Secure CEO by Mike Foster will help you protect your computer systems, your company, and your job!